The Novagard® RTV 400 Series is composed of single-component, moisture-curing and thixotropic paste products that cure from low to medium modulus, rubber-like solids. The cure mechanism is neutral (oxime), which is non-corrosive to metal substrates such as copper, aluminum and ferrous metals. This series has excellent adhesion to many substrates including metals, plastic and woods. Typical applications include bonding automotive trim, headlight assemblies, plastic vent pipes and fiber optic lighting. Sealing and gasketing applications include electrical and electronic equipment, cement and masonry and any area where the weather and environment needs to be sealed out. The Novagard® RTV 400 Series also includes two low-adhesion products for creating formed-in-placed gaskets where postproduction disassembly is required. 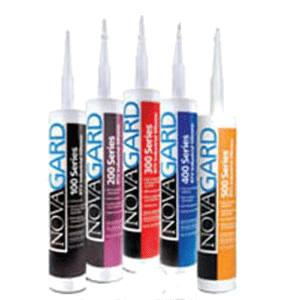 Description: Novagard fast cure sealants are single-component silicone sealants and/or adhesives. These are non-flowable, paste products that provide fast tack free times and high green strength. These fast cure products out perform slower materials in multi-step assembly applications. The fast tack and early strength combine to hold the assembly together as the unit moves from station to station. Physical Form: One-part non-slumping neutral cure RTV; cures at room temperature on exposure to moisture in air to a tough, rubbery solid. Description: Novagard low adhesion sealants are single-component, non-flowable RTV silicones that cure to a solid rubber like normal silicone RTV except with low adhesion. Ideal for creating formed-inplace gaskets where re-entry or post-production disassembly is necessary. Description: These products offer excellent adhesion to numerous substrates including plastics and metals. They also offer outstanding resistance to gasoline, brake fluid, antifreeze and most wheel cleaners. Special Characteristics: High tensile strength (300-400 psi), elongation (300-400%), adhesion (>45 pli) and chemical resistance. 400-155 translucent offers 200-250 psi tensile strength.